Dominion: Nocturne Cards revisited | Wake up, Meeples! It’s been a few months since the release of Nocturne. I captured some first impressions of how powerful each of the cards in the set was a few months ago; and a week or so ago I put up another poll to see what opinions people have after having some time to play with the cards. This blog post will show the results of that poll, along with a comparison to see which cards were the winners and losers. And finally, you’ll get to hear my opinions on the Nocturne cards and how I differ from the community. For more detail on my thoughts on each Nocturne card, you can check out this first impressions video, and then this podcast episode for more recent thoughts. 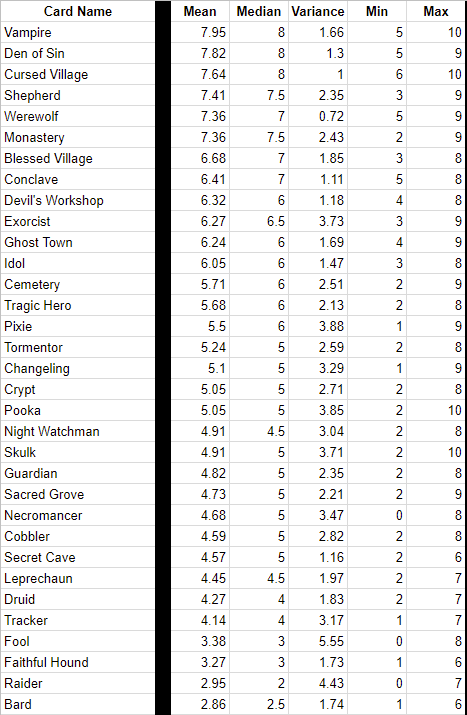 It seems like Monastery had a bit of potential that was missed by some folks at the start of things, and several cards have fallen out of favor by the crowd, including Necromancer, Cobbler, Raider, and Crypt. 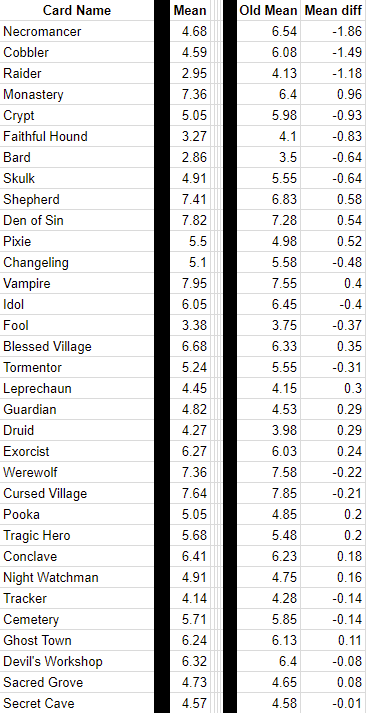 It seems like a lot of the Nocturne cards seemed to tend farther away from the low or high end of power level — almost all rankings were contained within the 3 to 8 range. I’ll use the ratings I have for the cards now, and compare them to the rankings we got here, and let’s address a few of the cards with the most disagreement! Cobbler: Wow, a 4.5 versus my 8 rating? There’s a huge disconnect here, and I don’t think I’m willing to budge and even say that Cobbler is a 7! Cobbler is so good, and I think it’s been seriously underrated. I seriously don’t know how anyone could rate this card lower than Ironworks, which is a solid 8 for me, but the community rated at 5.67 in the last poll — I guess that’s the core of the disconnect here, but man, gaining cards is amazing when you don’t have to spend an Action to do it. Guardian: I remember my initial impressions where I gave Guardian a 4, then after playing with it I changed my rating to a 2. The big thing this card has going against it is the fact that its effect minus the defense is really bad. It’s worse than Copper. That’s so bad, and while it isn’t terminal, it might as well be because it does nothing for your current turn, and so little for your next turn. Gaining this to hand just doesn’t matter enough to save this card. I stand by the 2. Leprechaun: Did you know that you can wish for Gold? That means you could gain TWO GOLDS with Leprechaun! OP OP!!!! Really though, even if you never get a Wish with this card it’s OK, and gaining a Wish is just so incredibly powerful, you can add a ton of payload to a deck that can overdraw, or you get extra flexibility in case you wanted something else. All you need is a Village and some modest amount of deck control and this card is worth getting almost all of the time. I even contemplated giving Leprechaun an 8. Idol: I started with Idol as a 6, then moved it down to a 4. I could see that being a little harsh, but I’m not super warm on this card. In any case, I don’t think there’s a huge disagreement here. Pooka: I gave it a 7, the average here was a 5. I wonder if people were taking Cursed Gold into account when rating Pooka, as it can be unplayable sometimes with no Curse trashing, but trash a Copper and draw a bunch of cards is pretty good, even with the awkward dance you have to do. Pooka is a solid card, I stand behind the 7. Ghost Town: 6.24, and I gave it an 8. 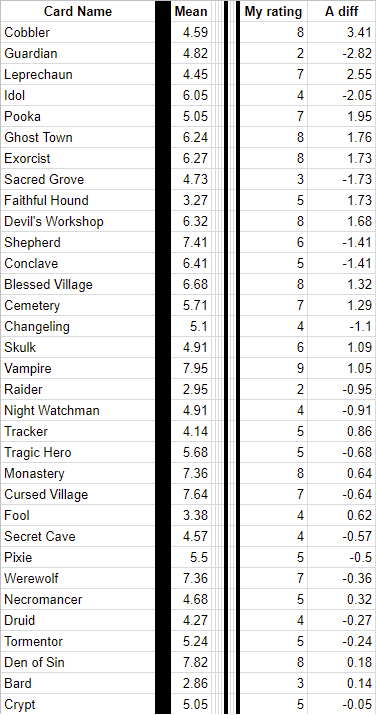 I don’t think my ratings for all villages are higher than normal, and Ghost Town is above average when it comes to villages, so yes, I think people have underrated this card for sure. While I could argue for my ratings over other ratings, I’d say there isn’t much of a disagreement from here down on the list. Let’s hear what you all think, how wrong am I? How wrong is everyone? This entry was posted in Dominion, Tabletop Games on February 28, 2018 by Adam Horton. Pingback: Dominion: Combined Card Power Levels | Wake up, Meeples!